Attention deficiency can become a barrier for many things to many people. Children diagnosed with Attention-deficit/Hyperactivity disorder may have a hard time concentrating in class, have a hard time sitting still during dinner, or may lack consistency. Adults with ADHD may struggle with organization at work or home. ADHD is defined by the Mayo Clinic as a chronic condition that affects millions of children and often persists into adulthood. ADHD includes a combination of problems, such as difficulty sustaining attention, hyperactivity and impulsive behavior. Besides proper medication, practicing Yoga can be another support to help ease the mind and relax the body. Yoga is an ancient art based on a harmonizing system of development for the body, mind, and spirit. Practicing yoga can help in slowing down the mind, relaxing the body, and becoming aware with your immediate present. In other words, for someone whose mind is racing, has a difficult time concentrating, and has extra energy, yoga can be a good support to help in reducing these emotions. The question is how do I even begin doing yoga? Well, get ready because here are your first 3 steps into beginning your journey to calmness and relaxation! Equipment – The beauty of yoga is that you need little to no equipment to start practicing yoga. There are a few recommendations though: a yoga mat to help cushion the floor, a water bottle and towel to keep yourself hydrated and dry off sweat, and comfortable clothes that will allow you to stretch. Environment – You can practice yoga anywhere but selecting a quiet and calm location would be the most ideal. Your goal, while practicing yoga, is to concentrate in your breathing and your poses. This is best done with little to no distractions. Having calming music playing quietly in the background can also help the body and mind slow down. Energy – Lastly, we concentrate on your energy. The end result of your yoga session is to feel calm, relaxed, and a bit more focused. For this you will need to leave everything at the door: worries, stress, issues, and anxieties. Pick a routine for yourself that you can practice at every yoga session. This will be the sign your body will use to begin slowing down. As you hold your yoga poses try and focus on your breathing, proper pose, and how your muscles feel. There will come a point (trust me) where your mind will be calm enough to even feel your own heartbeat. Current research has indicated that yoga helps in reducing anxiety, increases focus, and reduces extra energy in individuals diagnosed with ADHD. Yoga also has other benefits like increased physical fitness, flexibility, and cardiovascular health. So, grab a mat, find a quiet place, and begin your meditation. Websites like yoga.com can help get you started with poses and instructions. What is your favorite place to practice yoga? Thank you so much for the information. 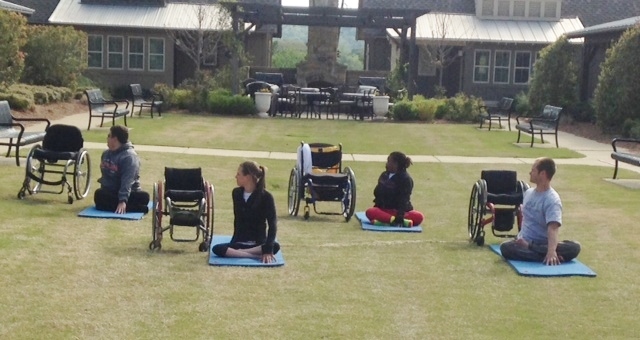 I am not sure very many people realize that Yoga can benefit many who maybe limited in movement. Yet, it can very benefit many want to increase movement.